Patricia Prince is a proven and effective mediator in the areas of employment, business, intellectual property, trust and probate, and personal injury disputes. She draws upon her significant breadth of knowledge and experience, gained as a civil litigator for over a decade and as a mediator since 2001, to move disputing parties from conflict to resolution. Ms. Prince is a bilingual Spanish–English speaker and is often called upon to conduct mediations and fact-finding investigations utilizing her language skills. A creative and sought–after ADR provider, Ms. Prince has successfully mediated hundreds of state and federal court cases and pre-litigation disputes. Prepared, analytical and a persistent problem solver, Ms. Prince is adept at working through impasse and committed to a fair and impartial mediation process. 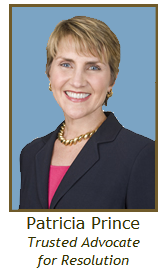 Patricia Prince has built a solid reputation as a successful mediator of difficult cases and is highly valued by her clients for her patience, her ability to grasp issues quickly and her talent for connecting with parties and counsel. to the root of the dispute. She uses her extensive legal expertise, strong negotiating abilities and personable demeanor to help parties craft realistic and enduring agreements. A former litigator, specializing in the areas of employment, intellectual property, securities, licensing, trademarks and general contract law for the investment, media, entertainment and high tech industries. Patricia began her mediation practice in 2001. Patricia Prince is frequently asked to participate as a guest speaker on the topic of mediation. Business and Employment mediator Patricia Prince is a trusted advocate for dispute resolution. Her analytical legal skills and her extensive Business Dispute Resolution and Employment Dispute Resolution experience are the basis for her recognized competence as a mediator. Equally important, however, are her integrity, optimism, persistence and empathy, which are critical to getting the dispute settled and building the client confidence required to bring about an optimal resolution. San Francisco Bay Area business mediator and employment mediator Patricia Prince provides a wealth of experience as an ADR service provider, lawyer and business professional to bring parties to resolution. An accomplished and skilled mediator, Ms. Prince has successfully resolved a broad range of disputes. Her practice focuses on employment mediation, including harassment, discrimination, wrongful termination and wage and hour cases; business mediation, including commercial real estate, commercial landlord/tenant, intellectual property, partnership and general contract cases; and property and estate mediation, including family–owned business, probate, trust and sibling inheritance disputes. As a mediator, Patricia Prince draws upon her significant breath of knowledge in the following areas of law, gained over 15 years as a business litigator, as well as her experience as a mediator. An Alternative Dispute Resolution (ADR) provider committed to providing clients with a fair process to resolve business and employment disputes, Patricia Prince offers private mediation services in San Francisco, Marin County and the Greater San Francisco Bay Area.